MANILA, Philippines, April 29, 2014 (ENS) – On Monday, the last day of his weeklong trip to Asia, President Barack Obama inspected a new U.S.-made electric minibus that will replace some of the city’s diesel jeepneys – vehicles that make Manila traffic so polluting and chaotic. Pangea Motors based in Vancouver, Washington manufactures the 16-passenger electric minibuses. Each minibus is called a Comet, which stands for City Optimized Managed Electric Transport. In conjunction with its Filipino partner company Global Electric Transportation (GET), Pangea is deploying zero-emission Comets in Manila, in an effort to reduce the pollution emitted by the city’s fleet of 50,000 jeepneys. Pangea is the exclusive provider and distributor of the electric vehicles for GET. 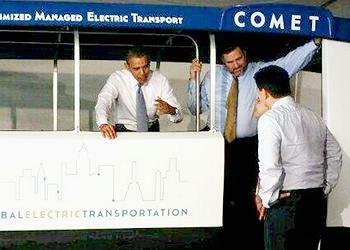 In Manila, President Obama first inspected an old red jeepney with shiny chrome fenders, then stepped aboard a prototype of the new electric Comet. The blue and white Comet viewed by the President is larger with higher ceilings than the jeepney, and it appears to be more comfortable. “He’s a big climate change guy. And that’s what we’re looking at,” said Tinga. “The way we were explaining it to him was that while many people are building electric vehicles for individual consumers, we build vehicles that are for mass transportation,” the former politician told “The Inquirer” newspaper, published in the Philippines. 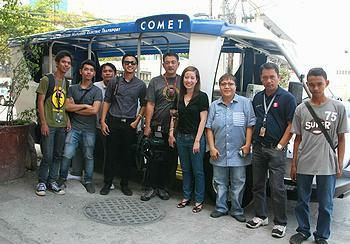 In May, about 30 Comets will be rolled out on the North Avenue-Monumento route in northern Metro Manila. Over the next three years, 30,000 jeepneys will be taken off the roads, to be replaced by 30,000 Comet drivers operating 15,000 Comets. The Comets feature safe and efficient lithium battery technology, providing up to a 100km (60 mile) range on a five-hour, 220 volt charge. Unlike the petrol-powered jeepneys, the electric Comets will not contribute to Manila’s growing smog problem. Today, diesel jeepneys in Manila contribute 15 percent of the particulate matter emissions and 11 percent of carbon dioxide emissions. The Comet is projected to curb the $50 million a day in economic losses the Philippines experiences due to traffic congestion and help mitigate the impacts of climate change. Manila is one of the world’s top five cities at risk of the adverse effects of climate change. “The demand called out to us,” said Michael Hippert, CEO of Pangea Motors. The Comets are expected to have a positive environmental impact by addressing not only issues of climate change,but also issues of air pollution and public health. Air pollution in the Philippines is responsible for $50 million in annual healthcare costs and 12 percent of total deaths and vehicles cause 85 percent of Manila’s air pollution. GET is currently developing the microgrid capability for sustainable charging of the Comets’ batteries. The GET venture is expected to provide an economic boost in the United States as well. In the next three years, GET anticipates purchaseing $200 million in high-end electronic components for the Comet from U.S. manufacturers.